I’m pleased with the progress I’m making on the panel now, but I’m becoming slightly anxious that I might run out of the gold thread before I finish the panel. I don’t know how thick the core is at the centre of the spool, and I’ve noticed that the kinks in the gold thread are getting tighter and more stubborn. If I do run out, that will put paid to the idea of photographing the finished piece for this year’s Christmas card. 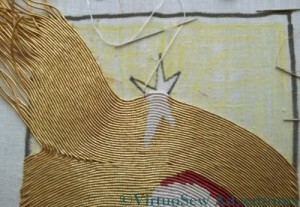 You can see from this shot that the extra thickness of the silk thread forming the star is creating an extra curve in the lines of gold. If I were working a classical piece of or nué, with straight lines of gold, I would be trying to space the lines to reduce the effect, or I would have chosen a finer silk thread, with the same aim. In this case, however, I am quite happy to add an extra couple of curves to the gold lines, because it will add life and movement to the background. If I have enough gold thread, I will rework the corner that is infilling that triangle on the left-hand side. I don’t think that the bends in the thread work as well as they might, and they are revealing the core more than I like. I need to finish the rest of the panel first, though. How about a note in tiny writing saying “No more twist”? Perhaps not. That probably only works for “four and twenty buttonholes of cherry coloured silk” although according to the story the note was found on Christmas morning! Are you absolutely sure all those tiny stitches weren’t done by mice? Oh my goodness – I’d be in a panic. I hate it when I think I’m coming to the end before I’m ready! You need a house elf to help you here. I hate that feeling of not knowing for sure if you will have enough thread. Every stitch makes me anxious, will I make it, should I stop. Be positive, you will have enough thread and then if you don’t you can send me a rude email. Having read the comments above, I think we all feel your panic! I hope you have enough thread. If not, I hope an exact colour match is readily available. The Christus Natus Est panel must be completed! Good luck! I’m just catching up on my blog feeds after a busy week or tw. My, you are making good progress on everything, especially the Christus Natus Est panel. Yikes, I hope you have enough threads. Each and every piece is lovely! It’s looking lovely. Hope you have enough thread! I’ve experienced similar panic when a pot of glaze is running out and I don’t have any replacement! Eeek! The little elephant in your previous post is divine. Let’s hope the core is a tiny one!